When the Cassini spacecraft launched into space nearly seven years ago, its destination - Saturn - appeared as a speck in a sea of stars. More than a billion miles later, Cassini has at last arrived at the ringed planet and discovered a dynamic world full of surprises. "Our ideas about the rings have been expanded tremendously," said Dr. Linda Spilker, deputy project scientist for the Cassini-Huygens mission, NASA's Jet Propulsion Laboratory, Pasadena Calif.
Only a week into the international Cassini-Huygens mission, new findings are already changing what we know about Saturn, its majestic rings, magnetosphere and many moons. Those discoveries include a mysterious material dubbed "dirt" in the gaps between Saturn's rings, a ringside cloud of escaping oxygen, and a puzzling picture of the surface and atmosphere of the planet's largest moon, Titan. "We have had a continuous stream of discoveries ever since we flew by the small moon Phoebe, which turned out to be a geologist's delight. Saturn's magnetosphere was bigger than expected, and Titan is indeed exotic and challenges the Cassini-Huygens scientists to explain its surface and atmosphere," said Dr. Dennis Matson, project scientist for the Cassini-Huygens mission. "We have just scratched the surface of this system. There is much more to see and measure." In addition to Titan, Cassini recently captured images of the moons Mimas, Tethys, Rhea and Iapetus. These and other new pictures from Saturn can be found as raw images at http://saturn.jpl.nasa.gov/multimedia/images/raw/index.cfm. Cassini is presently orbiting Saturn on the opposite side of the Sun from Earth. It will remain out of communication until July 12, 2004, when it reappears from behind the Sun. 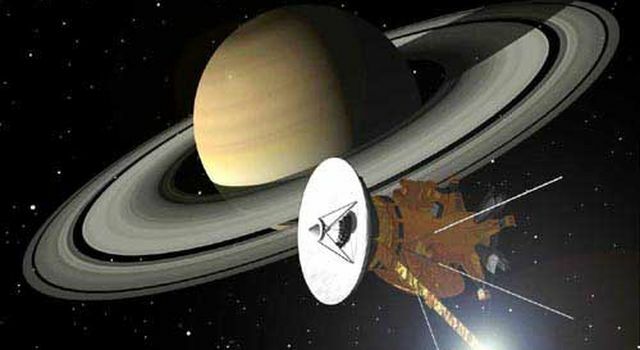 At 9:12 p.m. PDT on June 30, 2004, cheers and applause broke out at NASA's Jet Propulsion Laboratory when flight controllers announced that Cassini and its piggybacked Huygens probe had successfully become the first spacecraft to orbit Saturn. The spacecraft had passed through a gap between Saturn's F and G rings and executed a 96-minute engine burn before passing back out through the rings and swinging into orbit around Saturn. That ride into Saturn's orbit brought Cassini closer to the rings than it will ever be again and resulted in the most detailed pictures of the rings ever seen. The images, taken by the spacecraft's narrow angle camera, show density waves that resemble ripples on a pond and scalloped ring edges that look like textbook drawings. "The images are mind-boggling, just mind-boggling," said Dr. Carolyn Porco, Cassini imaging team leader, Space Science Institute, Boulder, Colo. "I've been working on this mission for 14 years and I shouldn't be surprised, but it is remarkable how startling it is to see these images for the first time." The sounds of Cassini's trip through the rings were recorded by the spacecraft's radio and plasma wave science instrument. Tiny dust particles, about 700 per second, rained down on Cassini as it crossed the ring plane, producing sounds like those of a hailstorm on a tin roof. 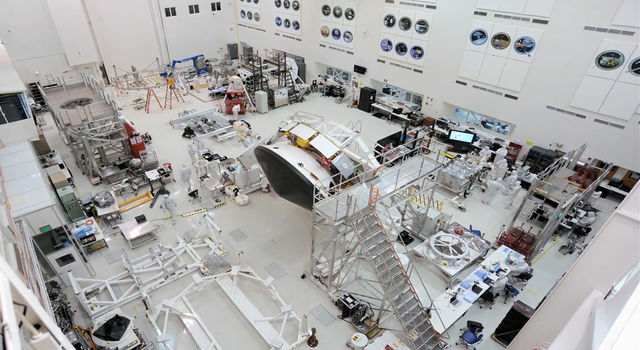 An analysis of the rings with the spacecraft's visual and infrared mapping spectrometer led to the discovery of an unidentified material that scientists are calling "dirt" until they can characterize it better. 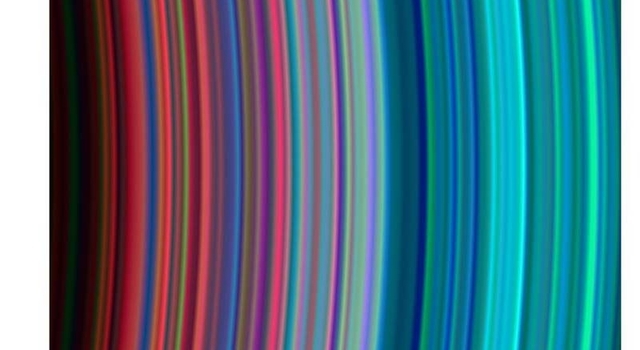 Saturn's rings are mostly made up of chunks of water ice, like snowballs, but the new data show that some of the gaps between the rings, as well as the F ring, contain an unknown impurity. This material appears remarkably similar to what Cassini previously observed on Saturn's moon, Phoebe, suggesting that perhaps the rings formed from an outer solar system object like Phoebe. Beyond the rings lies Saturn's magnetosphere, a magnetic bubble of charged particles like the one that envelopes Earth. Magnetospheres are invisible to the human eye, but Cassini's magnetospheric imaging instrument was able to see Saturn's for the first time. The image shows a huge, blob-like cloud of gas sweeping along with the moon Titan in orbit around Saturn. Scientists believe that this cloud is the result of highly energetic particles from Saturn's radiation belt, which bombard Titan and excite neutral gas permitting it to be imaged. Cassini also applied its ultraviolet eyes to Saturn on approach and noticed a dramatic loss of oxygen atoms coming from one side of the rings. The finding led scientists to hypothesize that something may have collided within the main rings, producing excess oxygen. 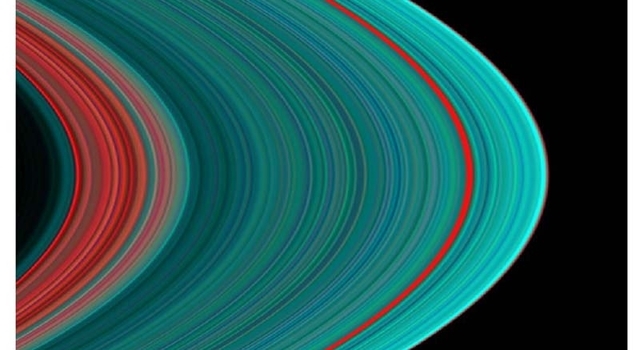 These data were acquired by Cassini's ultraviolet imaging spectrograph. On July 2, 2004, Cassini cruised past the planet-sized moon, Titan, at a distance of 339,000 kilometers (210,600 miles). 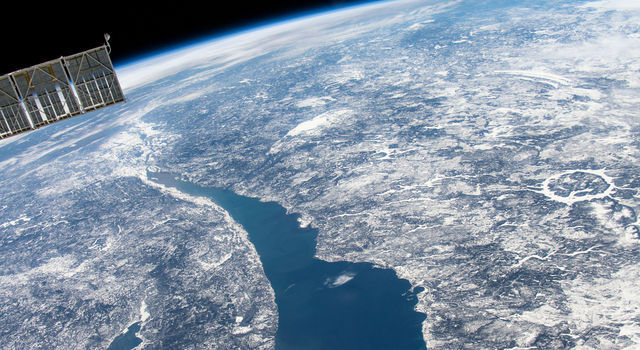 Scientists are interested in this frozen, foggy world because it may preserve in deep freeze many of the chemical compounds that preceded life on Earth. Using a combination of instruments onboard Cassini, the spacecraft was able to see through the veil of clouds that enshroud Titan. Images from Cassini's cameras show a large crater in addition to linear, circular and curvilinear features that imply geologic activity. The apparent lack of a multitude of craters also suggests a dynamic moon surface. 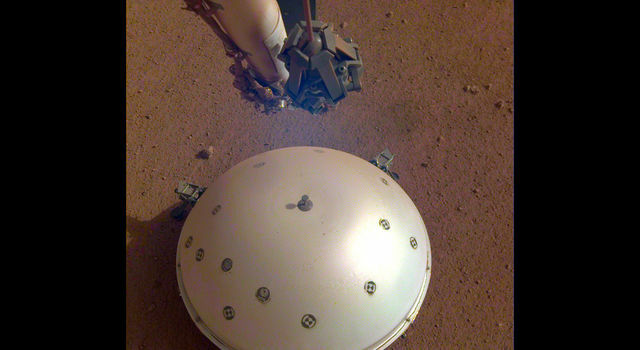 "We're seeing a totally alien surface," said Dr. Elizabeth Turtle of the University of Arizona, Tuscon. "We've got some exciting work cut out for us." Cassini's visible and infrared mapping spectrometer found that Titan's dark surface regions contain relatively pure water ice, while bright areas have higher concentrations of non-ice materials, such as hydrocarbons. This is the opposite of what scientists had predicted, and suggests that the dark regions are not methane lakes as previously believed. In addition, methane lakes would glisten like oceans on Earth and this telltale sign was not observed. While these are tantalizing and surprising results, scientists say that it is probably premature to draw any major conclusions about methane and other hydrocarbons on Titan. There will be 44 more Titan encounters in the prime mission, some at distances as great as 30 times closer to the surface than this recent flyby. Titan is the only moon in our solar system with a thick atmosphere. In December of this year, Cassini will kick off its Huygens probe, which will descend to Titan for a short-lived study of its enigmatic surface and atmosphere.